The Greek finance minister is a key figure in the Syriza-led government in Greece – elected on a radical, anti-austerity programme. He describes himself as an ‘erratic Marxist’. So, what does he stand for? And what programme can take the Greek workers’ struggle forward? 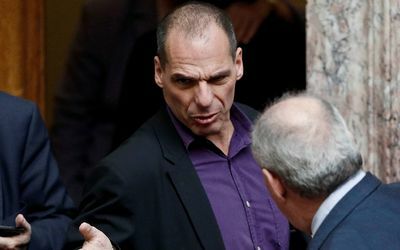 Yanis Varoufakis, the flamboyant finance minister in the new Greek government led by Syriza, has featured prominently in the drama being played out between the people of Greece, already crushed by brutal austerity, and the cruel demands of the EU for them to swallow more of the same. The seemingly defiant stance of prime minister, Alexis Tsipras, demanding that temporary alleviation be granted for Greece, has caught the imagination and support of the European working class and of the Greeks. Tsipras has been buttressed by Varoufakis, hurtling around Europe, tieless and in his motorbike boots, to meet EU counterparts like the stuffed shirt George Osborne. This reflects the bitter resistance of the Greek people to the virtual neo-colonial status to which they have been designated by ‘rich’ Europe – the capitalists, bankers, etc, who dominate the EU. But the crisis has not gone away, nor have the demands for further vicious austerity. The reality is that the government is on a knife edge and could be faced with further humiliating demands and defeat in a matter of months. Or it could appeal to the Greek people, in the first instance the working class, and equally as important to the European and world working class, for solidarity and common action. Reflecting this, the Guardian reported (9 March): “Greece’s anti-austerity government has raised the spectre of further political strife in the crisis-plagued country by saying it will consider calling a referendum, or fresh elections…” It has also raised the stakes in a mainly propaganda ploy by announcing its intention to sue German capitalism for second world war Nazi crimes against the Greek people, which could amount to €341 billion, more than enough to cancel Greece’s debt! Faced with the blackmail of capitalist Europe, seeking a further mandate is undoubtedly an option, but on what basis, on what programme? This poses another question: what are the guiding principles and perspectives of the government, particularly its leading figures? If a speech by Varoufakis in 2013, subsequently turned into a lengthy article in the Guardian on 18 February 2015, is a guide, the expectation of a fundamental change for working people seems remote. Fortunately, it may not be decided by him or even the government if the masses forcibly intervene, in what is a dynamic and fast-moving situation, to compel the introduction of urgent measures such as the democratic nationalisation of the banks and finance houses. This is the minimum necessary to prevent sabotage by the capitalists, which is already taking place, reflected in the daily outflow of billions of euros from Greece. The same goes for the scrapping of the scandalous sell-off and privatisation proposals, the prevention of evictions, etc, promised by Tsipras and Syriza before the elections. Nor is it ruled out that the masses, who are presently and generously extending time to the government to implement its programme, will have their patience exhausted and decide to act through a new ‘Occupy’ movement, not just of the squares but of the factories and workplaces. Varoufakis describes himself in his speech as an “erratic Marxist”. His analysis is certainly erratic and not in any way consistent with the demands of the working class and labour movement of Greece. There are scraps of ‘Marxism’ in his analysis, from Marxist economic writings, for instance, which are not at all completely correct. But even more alarming, given his prominent position in the government, is his conclusion that it is necessary to rescue European capitalism, from ‘itself’. He writes: “In 2008, capitalism had its second global spasm”. However, 2008 marked the beginning of a world crisis of capitalism; it was not a ‘spasm’. We characterised this from the beginning – as the crisis in the sub-prime housing sector in the U.S. was unfolding in 2007 – not as an episodic economic event, the likes of which we have seen before, but as the beginning of a drawn-out, devastating, generalised world economic crisis. This had been prepared by all the factors, including a series of financial bubbles, which we analysed and described throughout the lopsided boom. Moreover, we argued that capitalism would not be able to extricate itself easily from this devastating crisis. This in turn required the working class and labour movement to adopt a clear socialist action programme to defend living standards and change society. Varoufakis drew entirely different conclusions from this seminal event: “Should we welcome this crisis of European capitalism as an opportunity to replace it with a better system? Or should we be so worried about it as to embark upon a campaign for stabilising European capitalism? To me, the answer is clear. Europe’s crisis is far less likely to give birth to a better alternative to capitalism than it is to unleash dangerously regressive forces that have the capacity to cause a humanitarian bloodbath, while extinguishing the hope for any progressive moves for generations to come”. Yet, if capitalism is not ripe – indeed, rotten ripe – to be replaced by a more equitable, humane system during a devastating crisis, when would it be opportune to outline and fight for a socialist solution? At the beginning of the first world war, this kind of political philosophy – newly rehashed by Varoufakis – led directly to the betrayal by the social democrats, and to the shipwrecking of the subsequent revolutionary wave. The perfidious German social democrats argued that the first task was to rescue ‘civilisation’, by ‘saving’ capitalism – although not as bluntly and openly as Varoufakis does in his article. They showed this by voting for war credits to the Kaiser’s regime, with socialism and a change in society, in so far as it remained a goal for them, relegated to a distant, more ‘favourable’ future. Varoufakis does the same: “I am sad that I shall probably not be around to see a more radical agenda being adopted”. How does he know how quickly or slowly the consciousness of the mass of Greek working people will develop, particularly under the whip of an economically objectively pre-revolutionary situation? Even the great Marxist, Lenin, on the eve of the Russian revolution in late 1916, wondered whether his generation would live to see the socialist revolution. Yet only a year later, in October 1917, he presided over the most important working-class revolution ever, the greatest event in human history so far. However, while musing over the future prospects for socialism, Lenin was tirelessly preparing and mobilising the forces of the working class through the Bolshevik party, so that it would be able to seize the initiative and take power. The Greek working class may yet initiate a similar process for Europe, certainly southern Europe, and maybe the world. In contrast, the outlook of the German social democrats, and those who followed in their footsteps, led them to seek to save capitalism by entering blood-stained capitalist governments. Then, when the German revolution broke in 1918, they openly supported the capitalist parties. When these were discredited, they defended capitalism through governments in which they had a majority. In this way they acted as the main governmental obstacle to the working class taking power. 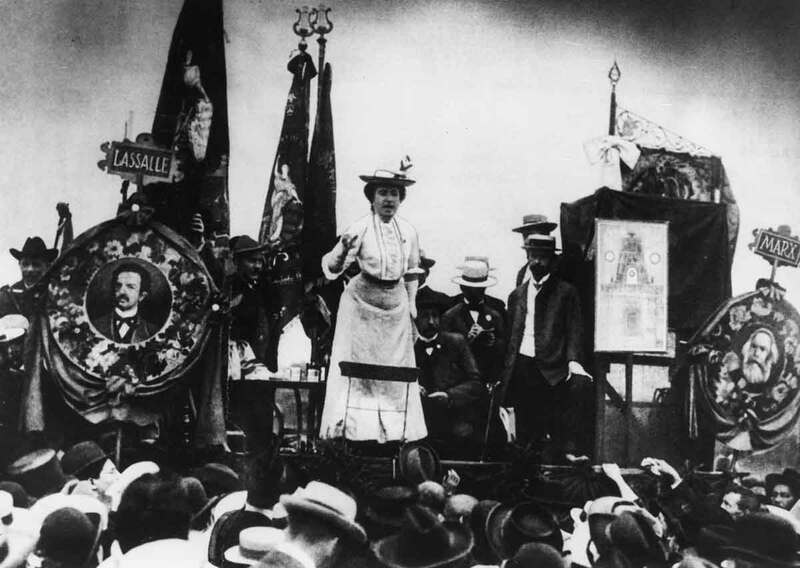 Rosa Luxemburg, on the other hand, posed the ultimate choice before the working class and humanity as “socialism or barbarism”. Her approach was completely borne out. The failure of the revolution of 1918 to 1923 and the revolutionary opportunities that existed from 1929 to 1933 were lost because of the criminal role of the leaders of the mass workers parties, the social democrats and the Communist Party, who refused to organise a united resistance against the Nazis. The consequences of this are well known: the coming to power of Hitler and the subsequent destruction of the organised power of the working class, which led to the horrors of the second world war, with its millions of victims. It is true that we do not face today the immediate prospect of socialism or barbarism, in Greece or in Europe as a whole. 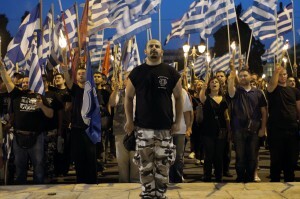 But there are sufficient elements of barbarism in Greece – unspeakable hunger and suffering, the rise of the neo-fascist Golden Dawn, etc – to indicate that, unless the working class and its organisations are prepared to carry through a fundamental change in society, these elements could become the dominating reality over time. The historical as well as contemporary experience of social democracy – to be more exact, the ex-social democracy – shows it cannot prevent this. It cannot even carry through a single lasting fundamental reform within crisis-ridden, diseased, European capitalism. Sustained reforms today are only possible as a by-product of radical and even revolutionary struggles. This has been borne out by the recent record of social-democratic governments in power in Europe, and shown by Varoufakis’s own experiences: “After I returned to Greece in 2000, I threw my lot in with the future prime minister George Papandreou, hoping to help stem the return to power of a resurgent right wing that wanted to push Greece towards xenophobia both domestically and in its foreign policy… [but] Papandreou’s party not only failed to stem xenophobia but, in the end, presided over the most virulent neoliberal macroeconomic policies that spearheaded the eurozone’s so-called bailouts thus, unwittingly, causing the return of Nazis to the streets of Athens”. We have to remember that, in words at least, Pasok in the past did not always behave so cravenly. The ‘reformists’ did not always betray. They presided over improvements, sometimes substantial, in the conditions of the masses. Pasok also moved towards the left at times, even adopting ‘revolutionary’ demands. The onset of the Greek, European and world crisis changed all that, particularly when it was in government. Like its cousins in Britain, France, Italy, etc, Pasok had no intention of breaking out of the vice of diseased capitalism and ended up carrying out the wishes of the troika. In turn, this created conditions in which Golden Dawn flourished. The same fate would await any government if it followed the economic and political prescriptions of Varoufakis which amount, as he admits, to saving capitalism. He writes: “If this means that it is we, the suitably erratic Marxists, who must try to save European capitalism from itself, so be it. Not out of love for European capitalism, for the eurozone, for Brussels, or for the European Central Bank, but just because we want to minimise the unnecessary human toll from this crisis. A Greek or a Portuguese or an Italian exit from the eurozone would soon lead to a fragmentation of European capitalism”. 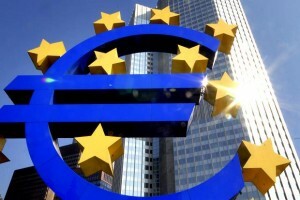 But Europe, both within the eurozone and outside, is already fragmented as a consequence of the setting up of the euro. Rather than creating a new internationalism, as its supporters argued, it has deepened national antagonisms, leading to the growth of sometimes virulent capitalist nationalism. From the outset, the creation of the euro was shot through with huge contradictions. It was an attempt by capitalism – reflecting the growth of the productive forces (science, technique, the organisation of labour) which seek to organise on a continental and world scale – to overcome the limits, the straitjacket, of the nation state. This was, as we have argued consistently, an impossible task on a capitalist basis, even though the national fissures were covered up, disguised somewhat, by the boom which crashed spectacularly in 2007-08. The formation of a common currency and the eurozone generated illusions – among the left and the labour movement, even in ‘Trotskyist’ circles like the United Secretariat of the Fourth International – that capitalism could overcome national contradictions and lead to the emergence of a kind of ‘European capitalism’. This could lead, they argued, to increased possibilities for unifying the working class on a continental scale. However, we anticipated that the national divisions – separate states, armies, etc – which had not completely disappeared, would savagely reassert themselves in the event of an economic crisis. And that is what has happened. Indeed, national conflict, and its attendant racial divisions and poison, the rise of the far right, etc, is much greater now than at the creation of the eurozone. Does this mean that we must adopt a narrow nationalist approach, with each country seeking a solution to its economic problems solely within its own national sphere? On the contrary, the productive forces are crying out to be organised on a European, even a world scale. But the only force that can achieve this historic task is the working class. Hence our slogan: ‘No to the bosses Europe; Yes to a European socialist confederation’. Struggles conducted on a national plane are organically linked to the international stage – in the first instance, within Europe itself. This is instinctively recognised by the Greek working class, as shown by its commonality and solidarity with the workers of southern Europe, particularly Spain, Portugal and Italy, and vice versa. Witness the presence of Podemos leaders at the mass rallies in Greece before the election. Varoufakis, in his analysis, seeks to draw heavily on British labour movement experiences – he resided there in the 1980s – as well as Greece. Unfortunately, he displays more than a whiff of the organic pessimism that characterised the Eurocommunist wing of the Communist Party of Great Britain gathered around the journal Marxism Today, by which he was probably influenced. This tendency completely capitulated politically to the ideas of neoliberalism and, as a consequence, virtually disappeared as a major trend. It became the fifth wheel of decaying social democracy, supporting the British Labour Party leadership of Neil Kinnock in his political counter-revolution against the Marxists – leading to the expulsion of supporters of Militant (the predecessor of the Socialist Party) – and the formal abandonment of the goal of socialism by Labour. This was done under the signboard of ‘modernising’ Marxism, adapting to the supposed contemporary situation. In reality, it was an abandonment of a class approach. Varoufakis attempts something similar in his article, even falsely accusing Karl Marx of errors for not anticipating how his ideas could be misused in the future – by implication, Stalinism. However, Marx famously declared about phrasemongers: “If this is Marxism, then I am not a Marxist”. Varoufakis also states: “This determination to have the complete, closed story, or model, the final word, is something I cannot forgive Marx for”. But Marxism is not a closed system. It is a flexible method of analysis, tested and verified against experience. In the hands of a good worker it can be a useful and necessary tool, but with a bad worker produces a bad output. Moreover, dogmatists, who have very little in common with genuine Marxism, can interpret ideas in a one-sided, non-dialectical fashion. We have made clear in Socialism Today that we disagree with those who seek to mechanically impose some alleged ‘laws’ on living reality – such as the tendency of the rate of profit to fall, which is not the explanation for the present crisis. Although we defend Marx’s basic proposition on the tendency of the rate of profit to decline, we profoundly disagree with this as the sole explanation, as some do, for the current crisis of capitalism. To blame Marx for Stalinism, as Varoufakis clearly implies, is wrong. Stalinism was originally the product of the isolation of the Russian revolution and its degeneration but has been used to misrepresent and corrupt the genuine ideas of Marxism. It is completely ahistorical to blame Marx for the later criminal misuse of his method and ideas. Nonetheless, Marx did anticipate the problems of bureaucracy and the adoption of undemocratic procedures within the workers’ movement and even a workers’ state. Hence his and Friedrich Engels’ writings on the Paris Commune of 1871, where the living example of workers’ democracy was drawn on by Marx on how a democratic workers’ state would be constructed: the election of officials, no representatives receiving more than a worker’s wage, the right of recall, etc. Varoufakis writes about his experiences in Britain: “Even as unemployment doubled and then trebled under Thatcher’s radical neoliberal interventions, I continued to harbour hope that Lenin was right: ‘Things have to get worse before they get better’. As life became nastier, more brutish and, for many, shorter, it occurred to me that I was tragically in error: things could get worse in perpetuity, without ever getting better… With every turn of the recession’s screw, the left became more introverted, less capable of producing a convincing progressive agenda and, meanwhile, the working class was being divided between those who dropped out of society and those co-opted into the neoliberal mind set. My hope that Thatcher would inadvertently bring about a new political revolution was well and truly bogus. All that sprang out of Thatcherism were extreme financialisation, the triumph of the shopping mall over the corner store, the fetishisation of housing and Tony Blair”. Varoufakis betrays a breath-taking misunderstanding of what actually transpired in Britain. Thatcher did not triumph in an almost seamless fashion, as he appears to suggest. She provoked the miners’ strike – a ‘civil war without guns’ – which, moreover, exercised a powerful effect on Greece at the time, given its own heroic struggles against the right. 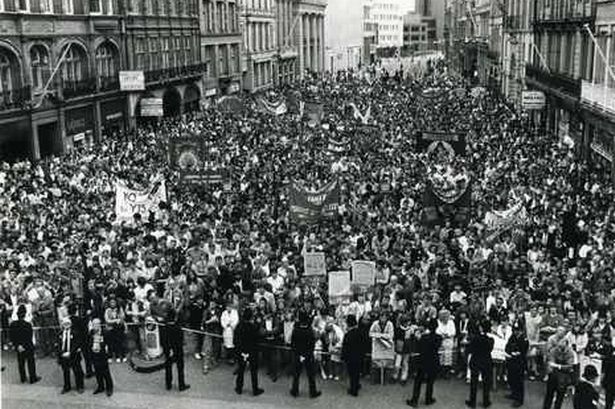 We also had the epic battle in Liverpool in which our predecessor, Militant, together with the Liverpool city council and its immortal 47 Labour councillors, saw Thatcher defeated. She was also defeated in the poll tax struggle when Militant led 18 million people in the mass non-payment campaign which succeeded in relegating the tax to history along with Thatcher herself, as she admitted later in her biography. Nor was it preordained that Thatcher’s victory was inevitable. There were opportunities which, if seized, could have led to a victory for the labour movement. 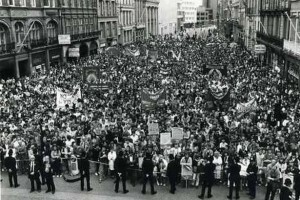 The betrayal of the miners by the trade union leaders, together with the rotten Labour Party leadership of Kinnock, who also stabbed Liverpool council in the back, was essential to her success. Does Varoufakis think that, had the British workers avoided drawing socialist conclusions and restricted themselves to his ‘progressive’ minimalist programme, they would have been more successful? 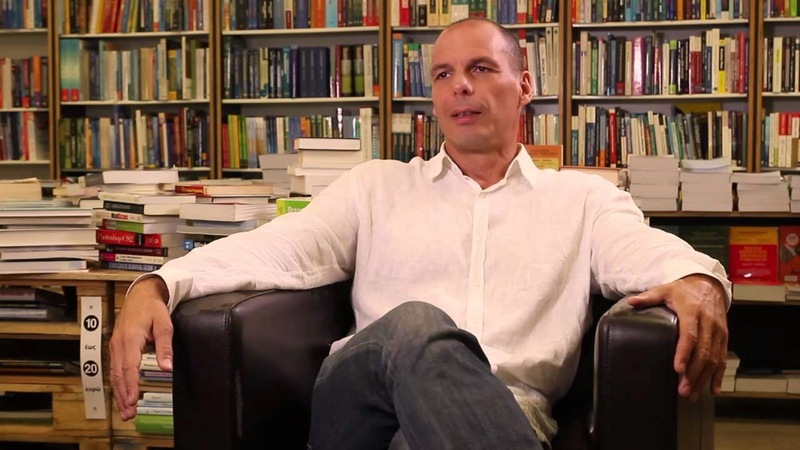 Varoufakis’s approach is taken straight from liberal capitalist opinion, including those such as Will Hutton and his Resolution Foundation, as well as the Labour leader, Ed Miliband. The Spanish co-thinkers of the Syriza leadership, Podemos, are in the process of possibly replacing the misnamed Socialist Party (PSOE) as the major force on the left, precisely because PSOE has been discredited for bowing the knee to Spanish capitalism. This capitulation took place during a huge boom but, nevertheless, PSOE was thrown out of office. How much more so would a social-democratic government be discredited in a crisis? We only have to look at France, where the leader of the Parti Socialiste, François Hollande, came to power promising a severe wealth tax on capital and a swathe of reforms which would benefit working people, only to retreat and seek to carry through a neoliberal programme. This has brought him and his supporters into a head-on clash with what remains of the left within the party, as well as the extra-parliamentary left forces and the working class. The consequences are that millions of workers who voted for the Parti Socialiste are now in the process of being severely disillusioned, with some of them even seduced into supporting the far-right Front National of Marine Le Pen. Although they do not state this as explicitly as Varoufakis, Hutton and Miliband are critics of the ‘austerians’ like David Cameron and the present Con-Dem coalition. They postulate, instead, a ‘better’ and, in the case of Miliband, even a ‘less predatory’ form of capitalism. But Miliband also advocates, along with the Tories, cuts in public spending, although promising they will be slightly less severe. What is the likely political result flowing from this? Mass political disaffection and disillusionment of former Labour supporters. Even if a Miliband Labour government was to sneak into power, either as a minority or in some kind of coalition, it would not be able to carry through its minimal programme without coming up against the ferocious defenders of the system. In justification for what he clearly considers is a different approach, Varoufakis writes of “a repugnant European capitalism whose implosion, despite its many ills, should be avoided at all costs. [This] is a confession intended to convince radicals that we have a contradictory mission: to arrest the freefall of European capitalism in order to buy the time we need to formulate its alternative”. Yet why could he and other ‘critical’ Marxists not have analysed the processes within capitalism beforehand to show that, prior to 2008, it was heading for a crash? This was the position of the CWI and its Greek organisation, Xekinima, which combined this analysis with a programme to defend the working class faced with an economic catastrophe. This was linked with the idea of seizing the opportunity that would be presented by raising the socialist alternative as the only way out for working people and their allies. Why wait for the crisis to break and then plead for time to formulate an alternative? Unfortunately, the approach of Varoufakis reflects the stance of Syriza and its leadership: a refusal to outline a clear line of approach and systematic demands to prepare the working class for the inevitable clash between the left government and capital, both domestically and internationally. Instead, there were general phrases about the ‘justice’ of Greece’s position and the reasonableness of a left government, made to ‘convince’ the capitalist forces ranged against Syriza to ‘understand’ Greece’s position and, therefore, make concessions. The Marxists of Xekinima and others criticised this approach as being politically naive, a bad case of wishful thinking – the most dangerous disease in politics, particularly against the background of an acute crisis. In the situation facing Greece up to and during the election, and particularly now, it is necessary to have the most brutally realistic analysis. This recognises the inevitable intention of international capital to shipwreck a radical government, whether it be in Greece, Spain or elsewhere, which would pose an existential risk to the capitalists. Indeed, in general, the approach of the left, never mind a Marxist-influenced government, should be to use capitalism’s difficulties as the labour movement’s opportunity to advance a profound process of socialist change. At its heart would be, firstly, to take over the main economic levers – the banks and finance houses – to prevent the sabotage and blackmail of the capitalists against the Syriza-led government. This has been reflected in the daily, panicky draining away of private capital from Greece which started even before the election. Therefore, the very minimum necessary is to control all in-goings and outgoings – if necessary, to gain some time for the working class to be mobilised and convinced of the need for further measures. Those would include the public ownership of the banking and financial sector under democratic workers’ control and management. Varoufakis sets out an entirely different scenario. With disarming honesty, he writes: “Given all this, you may be puzzled to hear me call myself a Marxist… while an unapologetic Marxist, I think it is important to resist him passionately in a variety of ways. To be, in other words, erratic in one’s Marxism”. The justification for this approach? 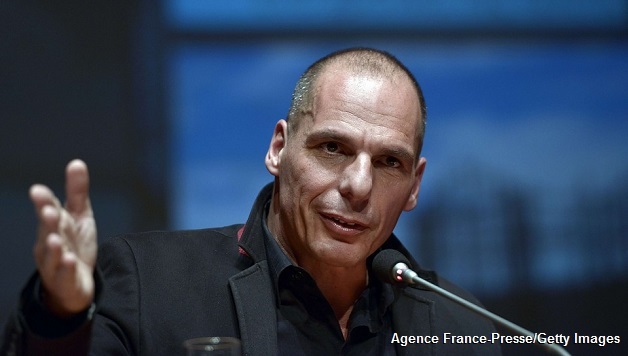 By in effect disguising your real Marxist views, admits Varoufakis. He writes: “A radical theorist can pursue… the construction of alternative theories to those of the establishment, hoping that they will be taken seriously”. But his approach is clear: “My view on this dilemma has always been that the powers that be are never perturbed by theories that embark from assumptions different to their own”. And he invokes the support of Marx himself for this approach. Because, you see, Marx drew on the great bourgeois economists, Adam Smith and David Ricardo, to show that capitalism was a contradictory system. On this basis, Marx understood the workings of capitalism, which would produce economic crisis and a working class, the gravedigger of the system itself, which would lead to its eventual overthrow. His intended audience, however, was not the bourgeoisie but the working class and its organisations. Varoufakis seems to be arguing something different, to work within the framework of bourgeois economics to show the inconsistencies of their system to the bourgeois themselves. His conclusion is to seek remedies to the economic ills that beset us – the working class and its allies – by putting forward ‘reasonable’ solutions which can be accepted by capitalism. The whole essence of the present situation, however, is that real reforms are not possible or lasting in a system ravaged by the greatest crisis since the 1930s. 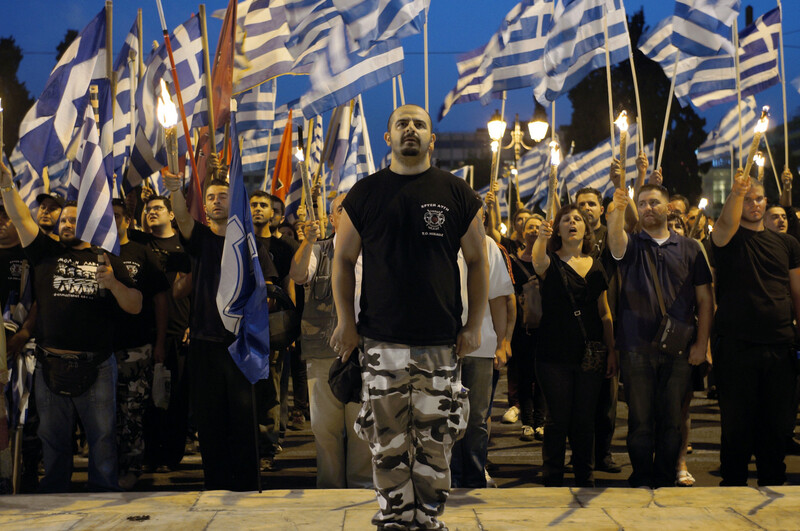 The eyes of the European working class are centred on Greece at this conjuncture. If the Greek workers manage to impose themselves on the situation, even partially, it will encourage and lift the heads of the whole movement. But if the Greek workers go down to defeat, this will impinge on the prospects for struggle on a European scale, at least temporarily. We fervently hope that the first perspective is the one that will transpire. It is for this reason that it is necessary to clarify the central ideas upon which the successful struggles of the European working class will be conducted. It is in this spirit that we offer our analysis of the situation and welcome and encourage any discussion around the theme of how best to help the struggles of the Greek workers at this stage.